I have to reposition it every time even if I lock it. In the middle of the screen makes any other activity impossible. I guess I'll try to edit the lua. Is there a frame name or something? Where is the position stored? I couldn't find it in layout-local. Edit: Found it!!!! I wasn't clicking the center button in MoveAnything safe move. I am one happy camper now. Not sure if the is a github or something to post reports to, I know this ia hugely popular but the author is not always around (last update time). One thing that would be nice to add to this addon would be the World Bosses in Pandaria! Man, the only thing from stoping me using this, there is no Option to search for Rare Mobs and Invsion Points. 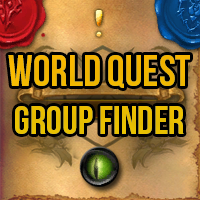 World Quest Tracker does this, and its such a big Quality of Life improvement. This so much, love the addon, but these features are needed! Would it be possible to hotkey the KICK function, maybe with a custom text one can add on kick? "Beerwolf: Stop being a realm-hopping parasite." Will you ever support WQGF to run on Carbonite one day ? This is my only issue since I usually find a Quest (Boss) and soloing it with my Tank (Dk) and I try to make my own group instead of looking for one the middle click button on the quest list is really good for it . Locals: errorMessage = "Usage: local questTitle, factionID, capped = C_TaskQuest.GetQuestInfoByQuestID(questID)"
Hey m8 i find a 2 bugs in logic of addon. Best Regards and awsome job. The delist is from the game itself, not from this addon. Love the addon but could you make a toggle to remove the message when you login. It's really annoying when you know that stuff. Have other things I rather see when I login. is anything wrong with the blacklist in version 0.24.3? when i wan't to change groups I am always joining the same group again. SUPER AMAZING WORK DONE GUYS !!!! Please tell us how to do it like before.. when arriving next to a WQ, to automatically do everything like before. Thanks. That's not possible anymore,which is the point. Blizz broke the addon on purpose to break those very features (it's been all over news sites too). These updates were to bring the addon back with at least SOME functionality vs none at all.